Portland's West End. All photos by Delfina Forstmann. Maine's Portland may be small, but the town has a food and drink culture that rivals the other Portland. For a first-time visitor, low-key local spots and in-season produce deliver a taste of what the town has to offer. PORTLAND, Maine – Known for its Old Port and outrageous seafood, Portland is also spotted with cozy restaurants, cool local bars, and unique independent shops, many of which have punny names (like a juice bar called Maine Squeeze or the Bite Into Maine lobster roll truck) that give a small town noticeable quirk. 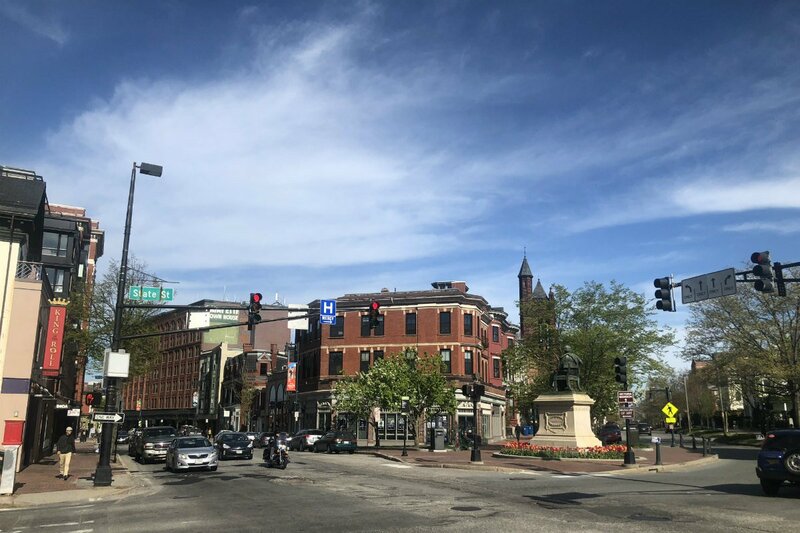 Delicious food, perfectly distilled spirits, and locally brewed beer can be found nestled among the quaint, cobblestoned streets with a village-y, welcome-home feel. Although most places don’t have a license to stay open past 1 a.m., you’ll appreciate the relatively early nights — the only way to get lobster this fresh is to have someone checking those traps at the crack of dawn. Laid-back and cozy, Portland is the place for a plate of shellfish and a good night’s sleep. The town is small and homey but still has cosmopolitan elements. Portland's West End is a historic yet vibrant area packed with galleries, an old book store, theater, restaurants, cute cafes, and bars (as well as familiar storefronts like Starbucks). 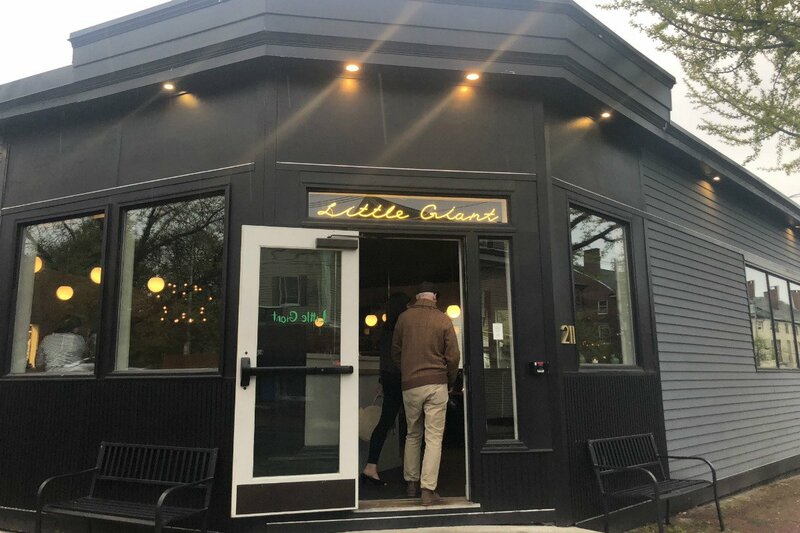 The food, as I discovered on a three-day trip this spring, ranges from classic local grub, like lobster rolls and comfort food, to swish cuisine served in contemporary settings. 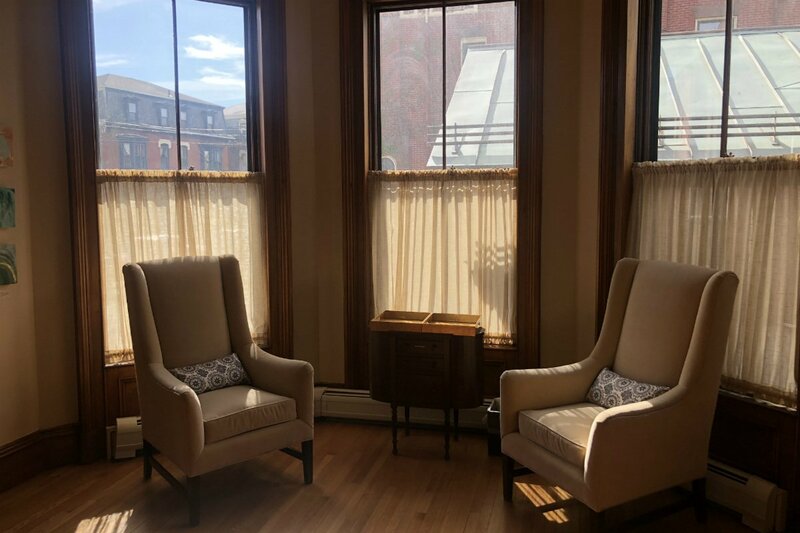 Afternoon sun in the lobby at The Francis. Cozy fireplace at The Francis. 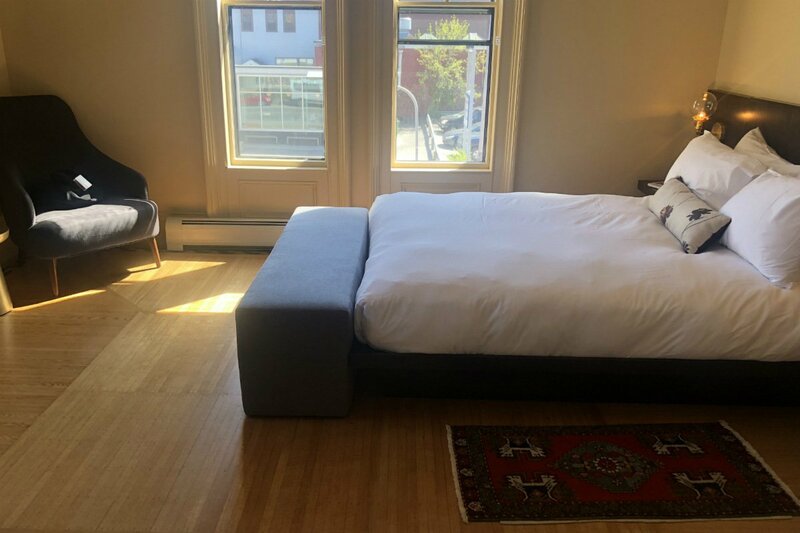 A simply furnished room at The Francis. For a boutiquey, B&B feel, opt for up-and-coming hotel The Francis. There are fifteen rooms and it’s family-run, making it homey and comfortable. You'll learn the receptionist's name and probably run into the owners at the little lobby bar. 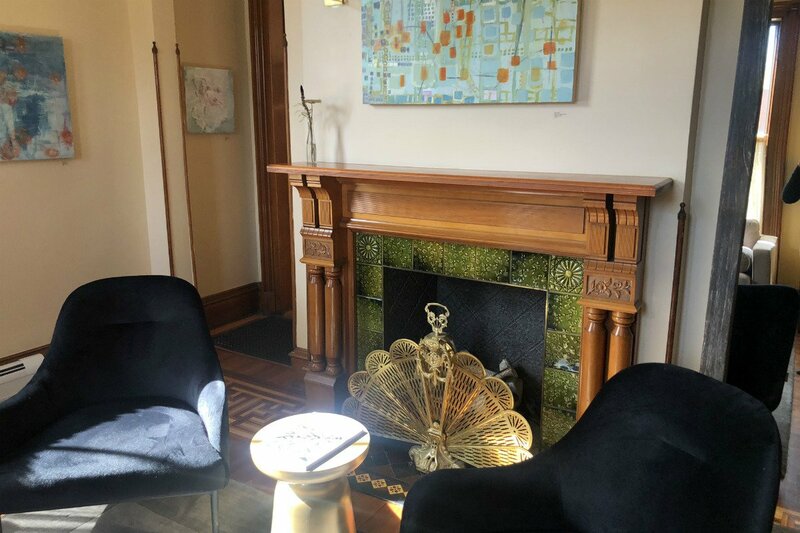 The hotel is full of nods to the area – installations by local artists are rotated through bedrooms every three to four months, and much of the building has been kept in its original form since 1881, including the stained glass front door. The mini bar is stocked with locally made spirits and snacks. The rooms are all slightly different, but each has plank wood floors and minimalistic modern furnishings. The bathrooms are well-supplied with goodie-bags from Farmaesthetics (made in nearby Rhode Island). The same product line is used in the spa, which, by the way, offers a menu of massages and facial treatments but has just one room (if you want an appointment, it’s best to book in advance). For something a little bigger and more conventional, look into The Press Hotel. It's located right between the Old Port and Arts District neighborhoods. The building used to house the printing plant and offices of the Portland Press Herald (the state’s largest newspaper, which relocated in 2010), and is decorated accordingly. The lobby has newspaper print wallpaper and a typewriter station where you can write letters and have then mailed for free, courtesy of the hotel. The rooms are modern and clean with very simple furniture in dark blues and greens. Burgers and table fries at Black Cow. Lobster tartar at Bolster Snow and Company. The entrance to Little Giant. On my first night in Portland, I ate at The Francis hotel restaurant Bolster Snow & Company. The food was high-end with a fresh twist — spicy broccoli salad with Asian flavors, a zesty lobster tartar, a warm gnocchi dish, pistachio crusted lamb, and other small and well thought out plates. 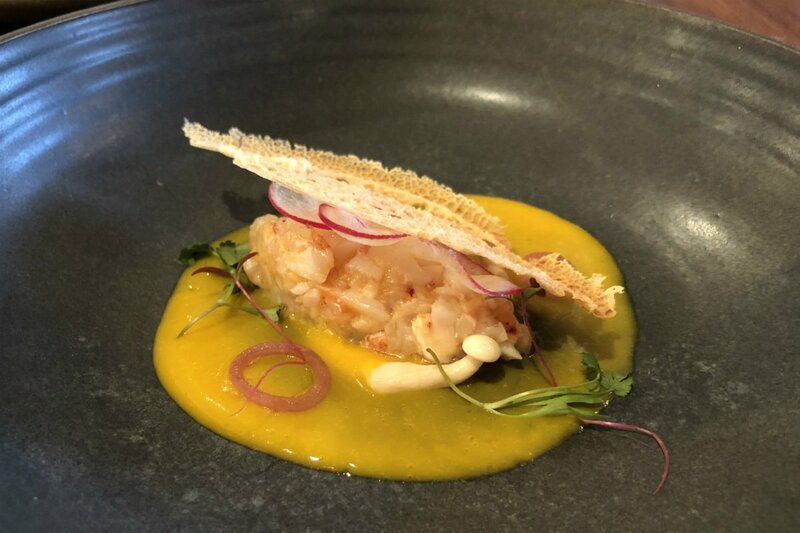 The chef, Nicholas Verdisco, is an Arizona native with Italian roots whose influences range from South American to Italy and in an unexpected but delightful fusion. Jean George was a mentor to the chef when he previously worked at The Inn at Pound Ridge by Jean Georges. The food also managed to stay true to local produce and wasn't too busy on the plate, despite its contrasting influences. Switching gears, I had a perfect cheat day indulgence at Black Cow. 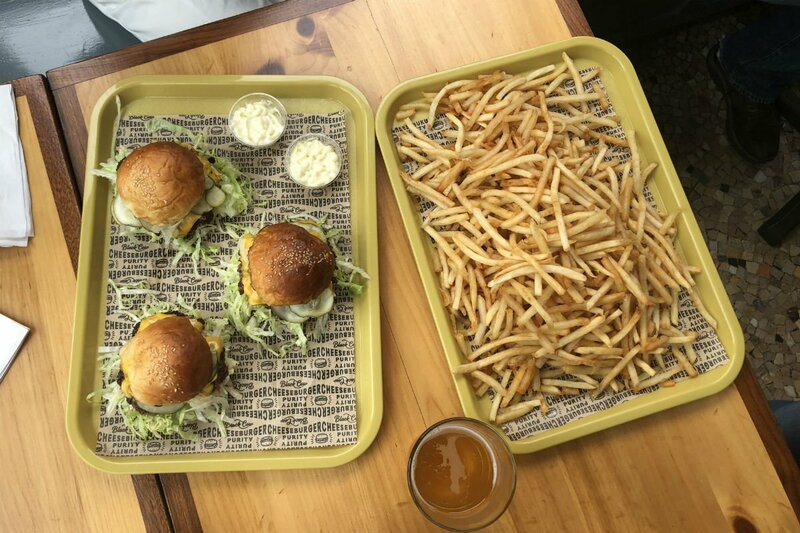 Burgers, shakes, grilled cheeses, and the infamous "table fries," a.k.a., a lifetime supply of french fries served on a cafeteria tray, did me in for the afternoon (I’m barely exaggerating). Little Giant was warm and hearty. There's no mistaking the spot for being anything other than family owned. Located in Portland’s West End neighborhood, it has a bright yellow door haloed by a neon light reading the restaurant’s name. The interiors are modern and clean. The intimate booths around the bar are surrounded by gray brick walls, while the bar itself is white honeycomb tile, neatly stocked with an assortment of local spirits. Past the arch by the booths is the dining room, well lit and finished with glossy wood floors, benches, and tables. The eggshell blue walls are lined with watercolor paintings of owners Briana Volk, her husband, and their two children. Briana explains that Little Giant is meant to be a restaurant you grow with and is appropriate for a first date or a family dinner with the kids. The food arrives on sturdy wooden trays (platters are called giants) and include a heaping range of charcuterie, sausages, and pickled vegetables. A full pig head is on the menu as well as a roast chicken that comes with mountains of biscuits baked to perfection. The flavors pack a punch, there's no way to leave without feeling well fed. Next door is a convenience store, owned by Little Giant, full of wine served at the restaurant, groceries, and pre-made takeaway dishes. The next morning, I went to Union for breakfast. The contemporary restaurant has an open kitchen, sleek wooden tables, and floor-to-ceiling windows that let in streams of natural light. The brunch is delicious, with plenty of choices, from granola and yogurt to eggs and sausage. The casual bar at Bunker Brewing. Brewing whisky at the New England Distillery. Exploring the local alcohol production was a really fantastic part of my trip. Briana, Little Giant's owner, showed me around local distilleries, breweries, and bars over the course of a few nights — she really knows her way around; she's an excellent resource for the local small-batch scene. I never thought I’d find myself on the way to a whisky tasting before noon, but trying the spirits at New England Distillery made it feel okay. 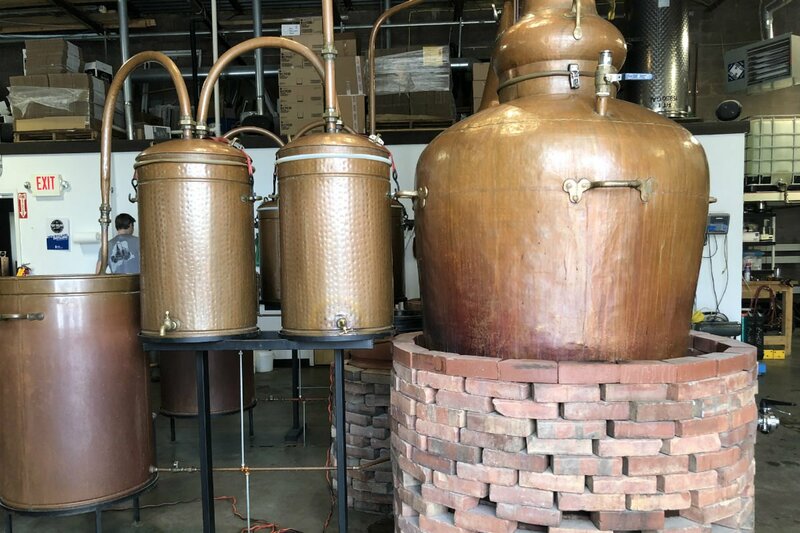 The history of the distillery goes down a long family line starting in the 1860’s, with Marylyn rye made in North Baltimore. 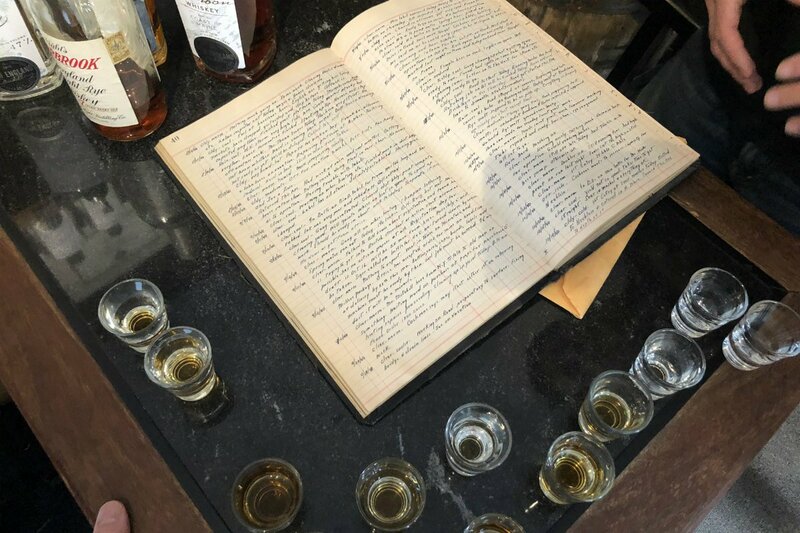 We got to take a peek at the old ledger used to log each day at the distillery, including a page full of dates during the Civil War. For artisanal and unique cocktails, Hunt and Alpine Club is a great place to experiment (this place is also owned by Little Giant). The menu is full of original cocktails with clever, detailed descriptions. Classic drinks, like a made-to-perfection Old Fashioned, are also on offer. 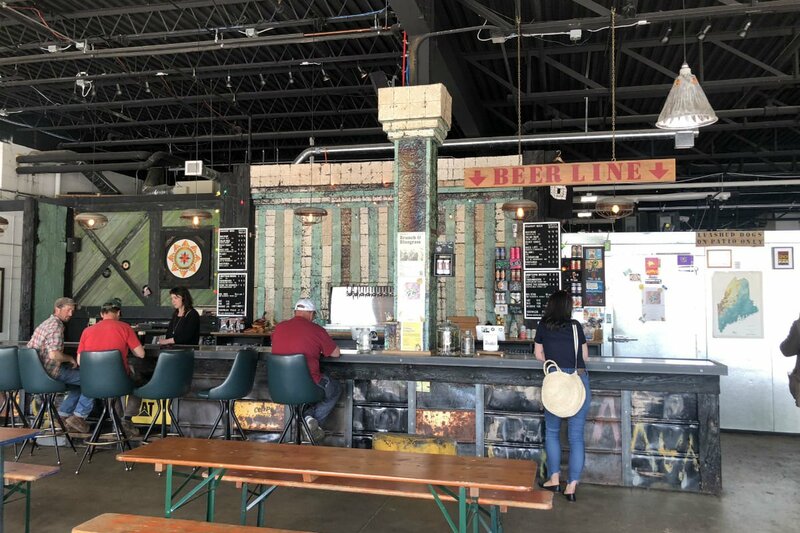 Ping-pong, friendly staff, and casual outside seating made Bunker Brewing and Beer Tasting an ideal place to enjoy a cold one after some serious burgers at Black Cow. I tried the Mexican brew, it was light and refreshing, served with a lime wedge. I didn’t make it to the Old Port on my trip and that's one of my regrets. It’s famously the most charming area and is one of the appeals of visiting Portland. Although its name seems to make that pretty obvious (PORT-land), I didn’t realize how much I was missing. The closest airport is Portland International Jetport, a 20-minute drive to and from Portland's West End. Portland is a rather walkable city, but to reach the breweries and distilleries in the surrounding areas, a car is definitely the way to go. April and May are a great time to be in Portland – it's finally starting to warm up, but isn’t too hot or too crowded. Construction projects begin when snow and ice finally melt in April and last until August, meaning the traffic is heavier than usual. Comfortable shoes and casual clothes. It's easiest to get around Portland on foot so comfort is key (most places are easy going).